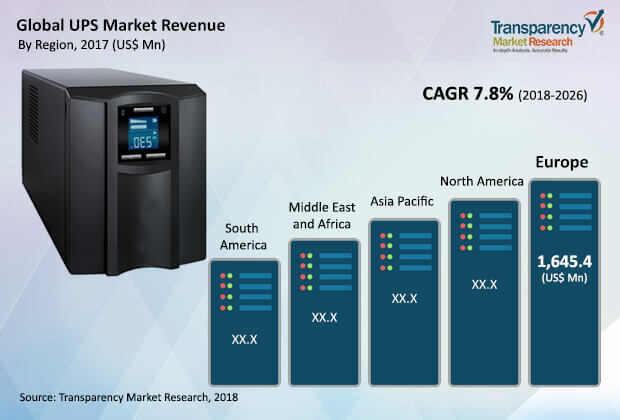 According to a new market report on UPS, published by Transparency Market Research, the global UPS market is expected to reach US$ 10,745.9 Mn by 2026, expanding at a CAGR of 7.8% from 2018 to 2026. According to the report, the global market will continue to be influenced by a range of macroeconomic and industry-specific factors. Asia Pacific will continue to be at the forefront of global demand, with the market in the region growing at a CAGR of 8.3% through 2026. Due to growing electricity failures, adoption rate of UPS has increased in order to protect various electronic equipment. Power failures are critical in areas where environment and public safety are at risk including hospitals and industrial areas. Hence, these sectors primarily concentrate on power backups in order to protect sensitive equipment from the adverse effects of grid power fluctuations. The global UPS market is broadly segmented by type, kVA range, application, and region. By type, the UPS market can be segmented into online, offline, and line interactive. The online segment is anticipated to be the highest revenue contributing segment in 2018 with 73.83% of total market revenue and is expected to rise at a significant CAGR of 8.0% over the forecast period. In terms of kVA range, the market has been divided into less than 5 kVA, 5.1-20 kVA, 20.1-60 kVA, 60.1-200 kVA, and above 200 kVA. In 2017, the 20.1-60 kVA range segment was the topmost revenue generating segment due to its high adoption in data centers. Based on application, the global UPS market has been segmented into data center & facility UPS, industrial UPS, marine UPS, network, server & storage UPS, PC, workstation & home UPS, and others. In 2016, data center & facility UPS segment was the highest revenue generating segment and is estimated to expand at a significant CAGR of 7.8% over the forecast period from 2018 to 2026. Presence of numerous market players and significant numbers of small and medium sized industries in North America especially in the U.S. is the primary factor responsible for the adoption of UPS systems in the region. In Asia Pacific, growth of cloud computing and large data centers in the region is expected to drive the regional UPS market over the forecast period. Proliferation of smartphones has generated the need for efficient and reliable data storage solutions. Low cost infrastructure and real estate availability, low labor cost, and countries with over a billion population are to be served with data center facilities in this region. Data center & facility UPS segment held the highest revenue share for the region in 2017 and is anticipated to expand at the highest CAGR of 8.6% over the forecast period. In Asia Pacific, China and India, followed by Japan, are projected to have a significant percentage of market share over the forecast period. The research study includes profiles of leading companies operating in the global UPS market. Market players have been profiled in terms of attributes such as company overview, financial overview, business strategies, and recent developments. Some of the prominent players identified in the UPS market includes - Schneider Electric SE, Eaton Corporation Plc., Emerson Electric Company, Uninterruptible Power Supplies Ltd., Legrand, Vertiv Co., ABB Ltd., Luminous Power Technologies, Mitsubishi Electric Corporation, and Delta Power Solutions. Companies are focusing on expanding their business through strategic acquisitions and partnerships with several end-use industries.